Robert Young is 14 years old and a freshman at the Grover Cleveland High School Humanities Magnet. He started playing violin when he was five years old in Kadima’s music program at his elementary school and picked up the viola three years later. He eventually switched his focus completely to viola. Now, he is the principal violist of both the Kadima Senior Philharmonic and the Kadima Conservatory Philharmonic. He is also a member of the Masterclass of Beth Elliott and Eric KM Clark. Outside of Kadima, Robert plays music in various forms. At Cleveland High School, Robert plays snare drum in the marching band, bass in the jazz band, viola in the pit ensemble for the school musical, and percussion in the concert band. 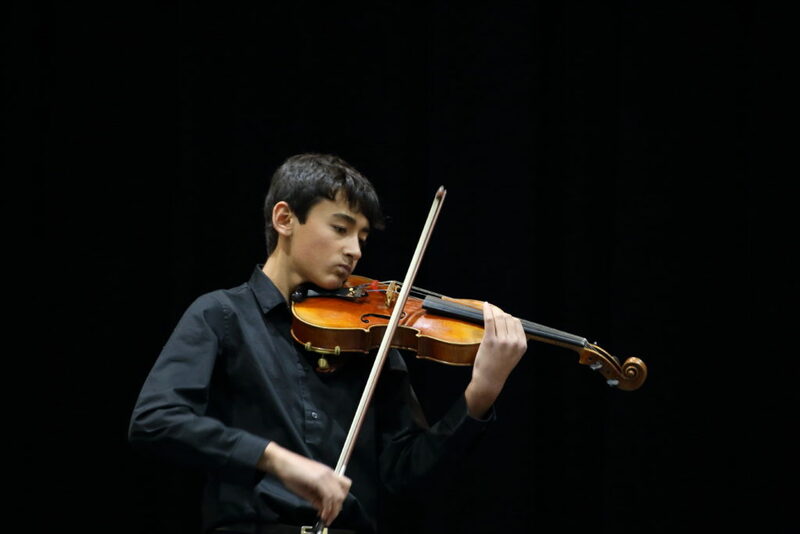 This year, he also started an Advanced Strings Club at his school, where he plays in a small chamber ensemble with some of his school friends. In addition to his school activities, Robert plays bass in Tangent, a rock band he formed with his Kadima friends. Robert’s favorite part of his musical experience has been making music with his close friends, most of which have been made at Kadima. He also enjoys playing music with his mom and twin brother, which he gets to do not only at Kadima but at home as well. Robert is extremely grateful for his teacher Beth Elliott and how much she has done to turn him into the musician he is today.